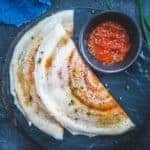 Indo Chinese Schezwan Dosa Recipe is a delicious fusion of South Indian and Chinese Cuisine and the end result is nothing less than lip smacking. 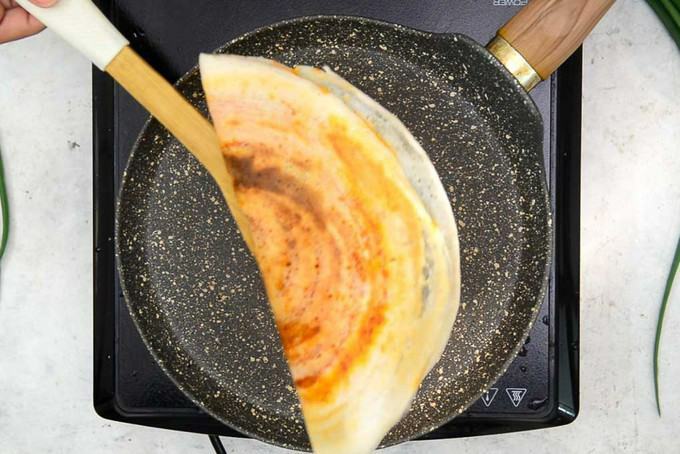 Here is how to make Schezwan Dosa at home. I am a huge fan of Indo-Chinese fusions. Especially, South Indian and Chinese. It is like the best of both worlds. Crispy dosas and spicy Chinese is a combination I wouldn’t mind savouring anywhere and at any time of the day. I first ate a Schezwan Dosa at a mall outlet and have been hooked ever since. This Chinese Schezwan Dosa recipe I have here is a simple step by step process to make those perfect, delicious beauties yourself. Have some leftover or cut veggies ready? Even better. Rest assured that your health is in good hands as all the veggies that go into it are fresh. I always make sure to prepare this on the weekends or at family get-togethers and my family is always thankful for it. Mumbai street food has changes it’s game by serving Chinese style dosa recipes. 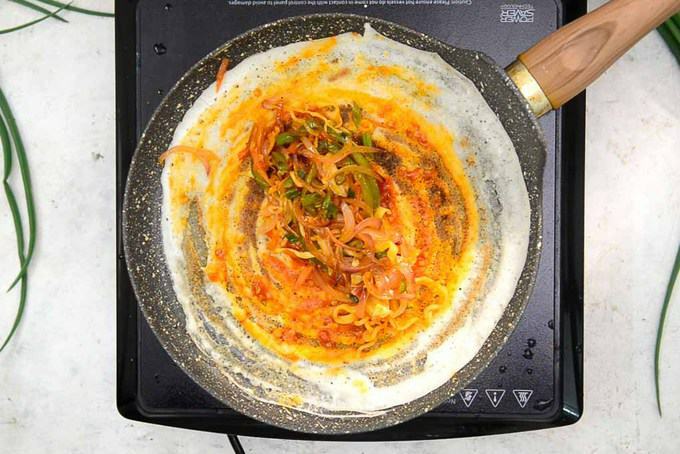 But this Schezwan Dosa Recipe is easy to make at home as well. 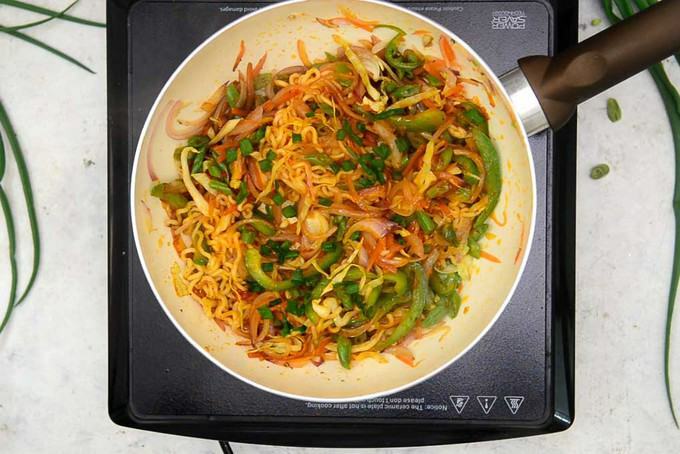 You just need some Dosa batter, a medley of vegetables and Schezwan Sauce and other Chinese sauces and you are good to go. Do give this recipe a try and there are going to be some compliments on your cooking skills coming your way. Indo-Chinese vermicelli or Schezwan Egg Fried Rice are another fusion breakfast dish that you can try. Here is how to make Indo Chinese Schezwan Dosa Recipe. This recipe is very customisable. You can add the veggies you like and skip the ones you don’t. You can add mushrooms, water chest nut etc to the filling too. If you like to eat Non Veg Food, boiled and shredded chicken and shrimps can be added in the filling too. Decrease or increase the amount of sauces according to your taste. If you like spicy food, increase the amount of schezwan sauce in the filling. You can skip adding noodles in the filling if you wish to. 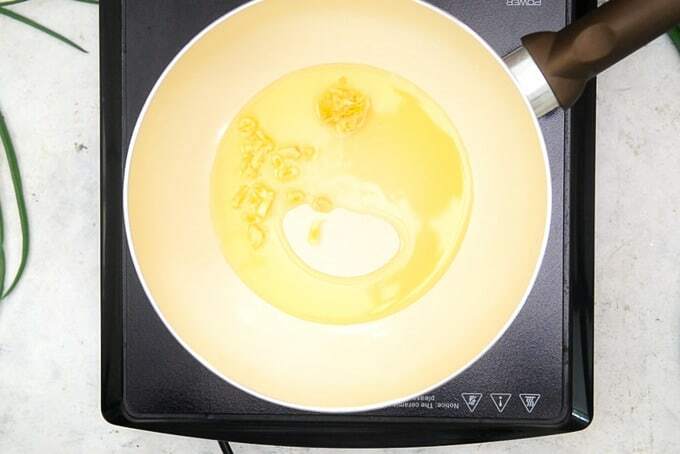 Add ginger and garlic when oil becomes hot. Saute for just few seconds. Add onions, green chillies and saute on high heat for 30 secs. Add capsicum, carrots, cabbage and beans. Fry them on high heat for 2-3 mins. Veggies should remain crunchy. 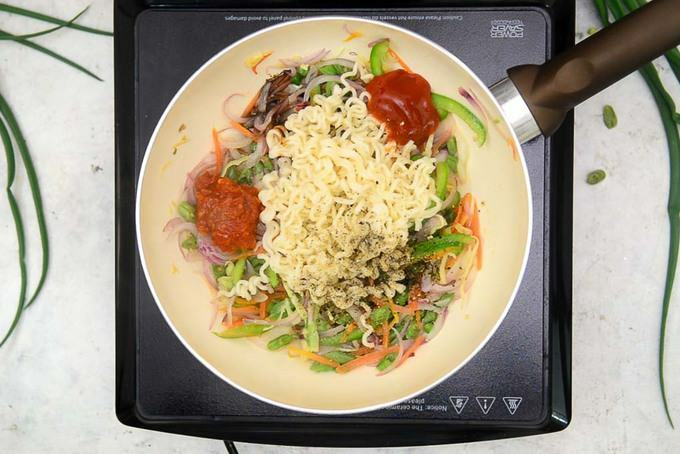 Add boiled noodles along with 2 tsp Schezwan sauce, tomato sauce, soy sauce, vinegar, pepper and salt. Toss them well to coat everything with sauces nicely. 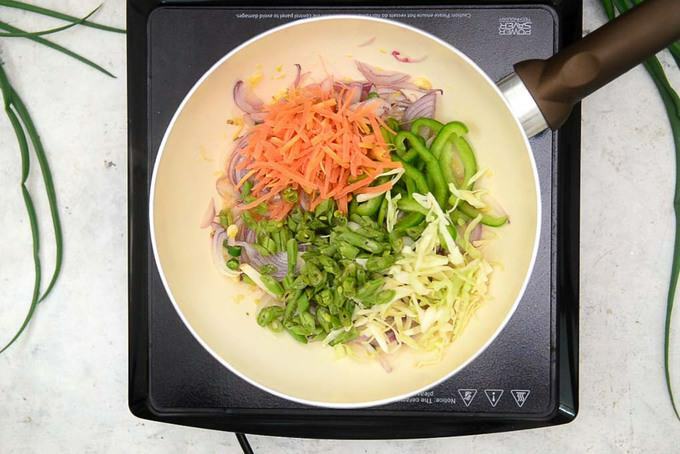 Switch off the flame and mix in spring onion greens. Let the stuffing cool down little bit. Now, heat a non stick griddle pan. Brush lightly with oil. Wipe it with a tissue. 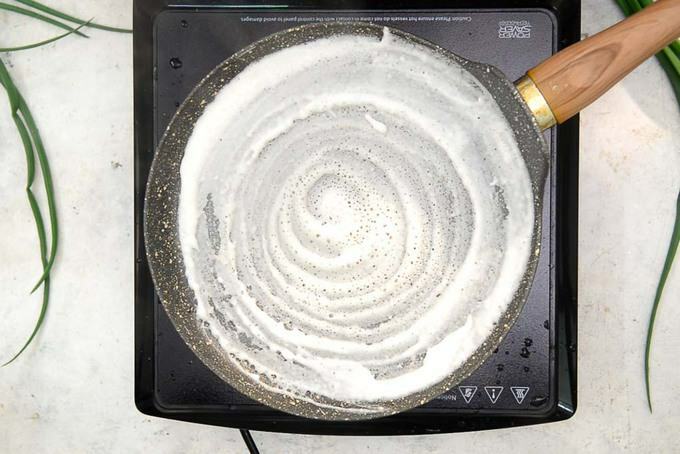 Pour one ladleful of dosa batter and spread it to make big dosa. 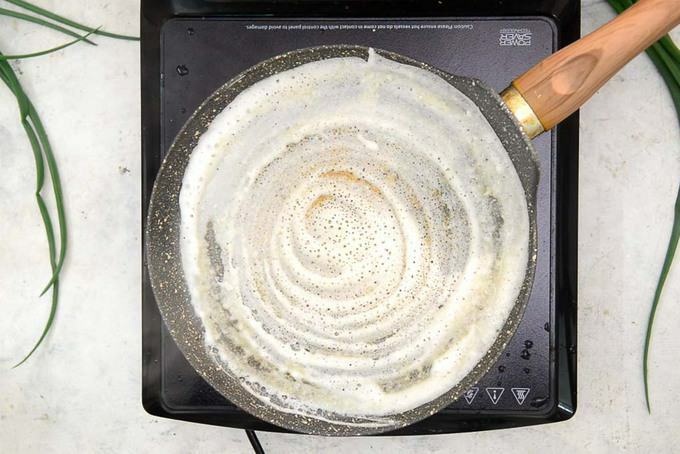 Smear some oil on sides and top of the dosa. 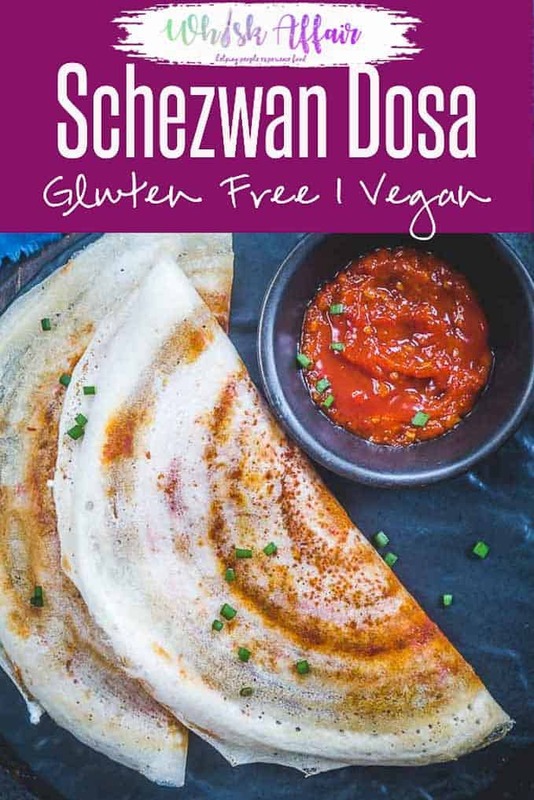 Spread the Schezwan sauce nicely on the top of dosa. Let the dosa become nicely crisp from bottom and cooked from top as well. No need to flip and cook the other side. Place some stuffing on one side of dosa and carefully lift the other side and fold into half moon. 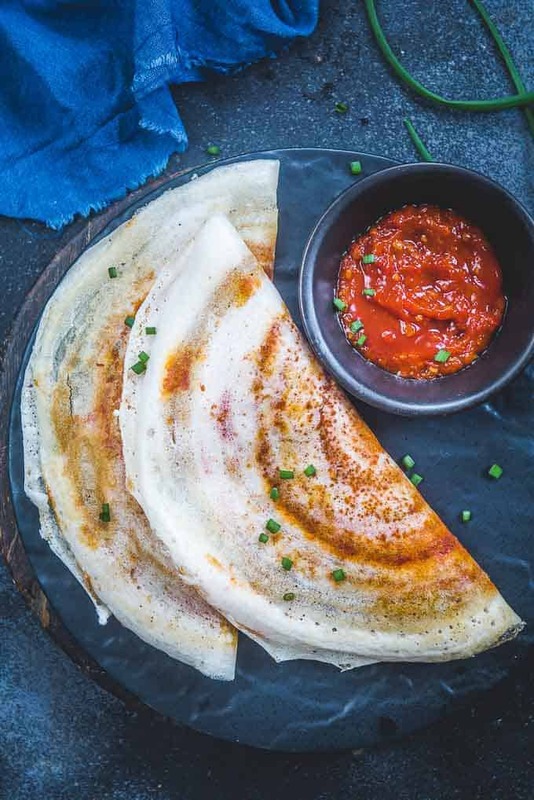 Indo Chinese Schezwan Dosa Recipe is a delicious fusion of South Indian and Chinese Cuisine and the end result is nothing less than lip smacking. 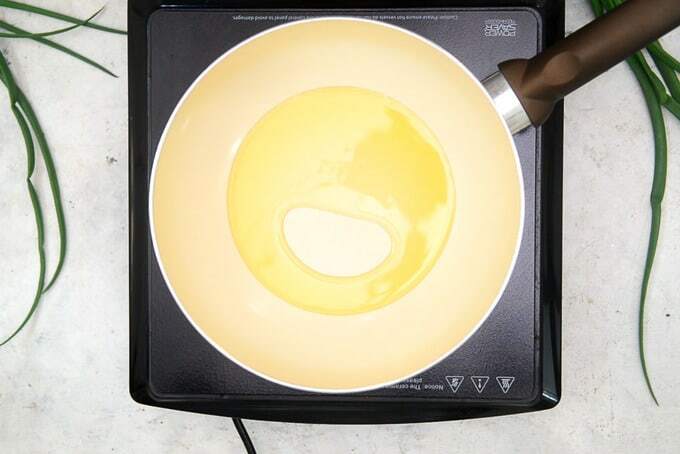 To prepare the filling for dosa, heat oil in a wok. Add ginger and garlic when oil becomes hot. Saute for just few seconds. Add capsicum, carrots, cabbage and beans. Fry them on high heat for 2-3 mins. Toss them well to coat everything with sauces nicely. 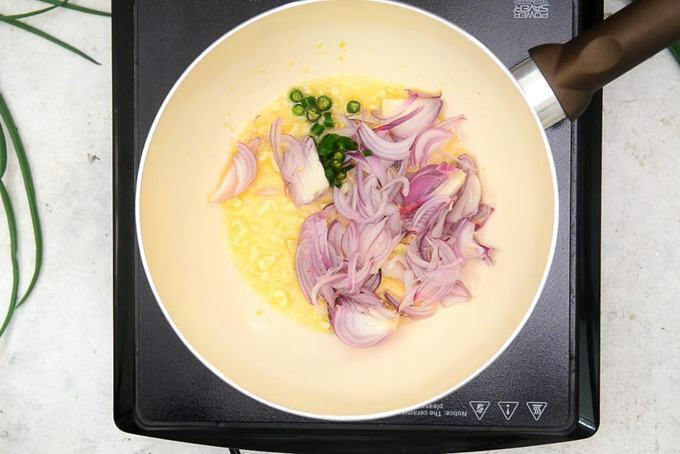 Switch off the flame and mix in spring onion greens. Let the stuffing cool down little bit. 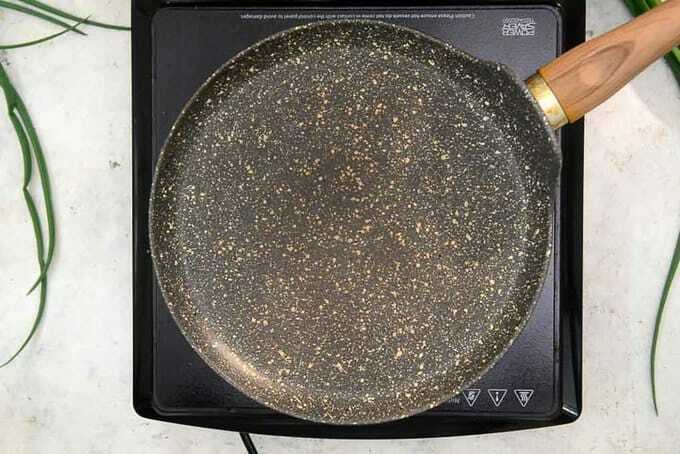 Now, heat a non stick griddle pan. Wipe it with a tissue. 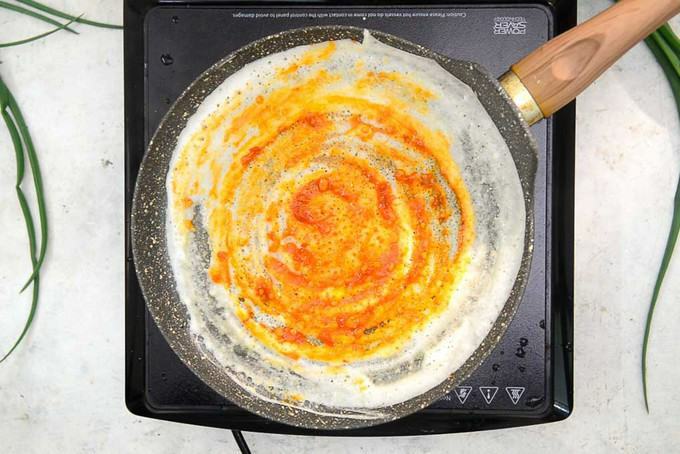 Spread the Schezwan sauce nicely on the top of dosa. Let the dosa become nicely crisp from bottom and cooked from top as well. No need to flip and cook the other side. Take it out on to a plate.